Born in Arkansas in 1940 to Cherokee parents, Jimmie Durham began making art without any real knowledge of what it was or what it could be: “I was trying to make sense of something. I was trying to see if I could investigate certain things with objects, with doing things with materials. And I didn’t know that was an art project, it was just my own personal project”. As seen in early works from the 1960s and 1970s, most of which are untitled, sculpture became a way of interacting with the world through making. Using his skills as a carpenter, Durham created carefully crafted objects, combining domestic materials such as leather, tin and nails with granite or sumptuous oak. Transmitting a quiet sense of beauty, these early experiments contrast strongly with more recent works such as Still Life with Stone and Car, a powerful installation piece, where the artist dropped a large rock onto a Ford Festiva at the 2004 Biennale of Sydney. When reading about Durham’s work, one word appears more frequently than any other: belief. In his words, he wants his art to be “investigative, and therefore not impressive, not believable”. Durham insists that belief – in art, politics and dominant systems of thought – decimates our ability to think critically and have meaningful aesthetic experiences. Since the 1960s, when he began making art, Durham’s suspicion of belief and binary thought inspired him to conduct his own conversation with the world. Through physical and intellectual experimentation, he has become one of the most significant artists of his generation - an artist whose sculptures, installations, performances and videoworks unsettle the meanings of objects and social conventions. While strikingly different in scale and aesthetic, early works such as Untitled (1970) – an exquisite mahogany sculpture inlaid with marbles – have some significant commonalities with the work he’s produced in more recent years. Drawn to materials used to make tools, Durham has maintained empathy with the instruments of making. Often incorporating materials such as wood, bone, feathers and – most prominently – stone, his early sculptures are the result of a playful negotiation with materials that has continued to characterise his work over the years. Following these two significant surveys, which focused on works made since Durham moved to Europe in 1994, a comprehensive retrospective has been organised by the Museum of Contemporary Art Antwerp (M HKA). A Matter of Life and Death and Singing curated by Bart De Baere and Anders Kreuger is now on show until mid-November this year. Unlike Durham’s previous retrospectives, the survey at M HKA spans all of his creative periods and is accompanied by a generously illustrated book, including three new essays on the artist. Featuring more than 100 works, the exhibition provides a rare opportunity to view earlier pieces from Durham’s time in America alongside works produced in recent years. As the museum explains “this exhibition looks exhaustively at his activities as an activist, essayist, poet, performance artist and sculptor and devotes plenty of attention to work from the 1960s and documentary material, neither of which has ever been seen in Europe before”. The artist’s nomadic existence, which began at the age of 16 when he moved to Texas, must be considered when viewing this expansive retrospective. Moving from city to city – from Geneva to New York to Brussels – the artist’s peripatetic nature is reflected in the structure of the exhibition. However, as Anders Kreuger, the show’s curator, explains “it does not privilege his ethnic or cultural origins”. Presenting ensembles of work that are not always chronologically organised, A Matter of Life and Death and Singing is a tapestry of Durham’s oeuvre that focuses on the fact that some “ideas and images recur in different forms at different stages in his career”. Significantly, the retrospective is not divided into formally recognisable segments. Rather, it reveals certain interrelated themes, for example his fascination with dead animals, his critique of architecture, and his ongoing use of stone as an artistic material. Always imbued with a sense of humour and playfulness, Durham’s work incorporates stone in a variety of ways. Displayed as vandalised vitrines (A Stone from François Villon’s House in Paris) (1996/2009) and crushed aircrafts (Encore Tranquillité [Calm Again]) (2008), these works reflect his seriousness and wit, his aesthetic and political engagement. As Kreuger explains: “For Jimmie Durham, there’s an important distinction between when a stone is allowed to be just stone and when it is used as a tool”. The difference, however, is not always clear cut. For example: “What happens when you throw a stone at something? You might argue that you use it as a tool, but you may also argue that you release the stone into its own element; you allow it to become just stone”. Articulated in different ways in different works, Durham’s playful use of stone undercuts the classical tradition of sculpture. Indeed, the idea of the strict difference between something that is alive and something that is not, something animate and something inanimate, is not applicable to Jimmie Durham’s work in general. In other works, where the artist portrays animals or humans, it’s quite difficult to tell if the animal is alive or dead; if the human is historical or contemporary. As seen in Jesus, a detail from an installation presented at Documenta (9) in 1992, Durham’s embrace of paradox and contradiction can be seen in his variegated use of colour and materials. A figurative sculpture based on the image of a human face divided in two – one delicately sculpted in tropical wood and one which looks as if it has been smeared with clay – Jesus shows the different approaches to sculpture that were prominent in Durham’s works from the 1980s and 1990s. While Durham’s work is grounded in intellectual and political enquiry, his affinity with the formal properties of objects ensures that his art is accessible and visually rich. With a wit reminiscent of Duchamp, he uses all the components of what is today called visual art – the object, the image, the word, the action – to confront the friction between Western supremacy and marginalised or indigenous cultures. As seen in Bedia’s Muffler (1985) and Bedia’s Stirring Wheel (1985), where a car’s steering wheel is adorned with hides and animal trophies, identity politics loom large in his earlier work. A Native American working in a predominantly European context, Durham is aware that his background and cultural conditioning have informed his journey as an artist. Yet despite his long-standing empathy with certain materials, Durham has always resisted the development of an easily identifiable style. Crucially, when an aspect of his work becomes charming or recurrent, he’s inclined to try something new. The most significant example of this tendency was seen in the late 1990s when the artist gradually moved away from the style of bricolage. As a result, it seems that over the last two decades, his multi-faceted constellations of objects have been gradually replaced by a desire for intervention and visual immediacy. Turning his gaze towards European architecture and its relationship with the power of the state, Durham’s large-scale works from recent years toy with notions of power, politics and metaphor. 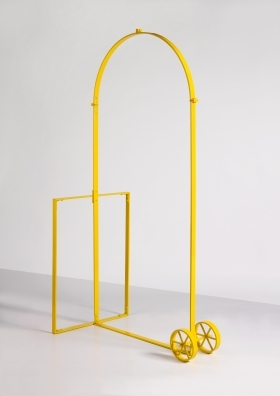 Often alluding to politically-charged structures – as in Arc de Triomphe for Personal Use (Yellow) (2007) – these striking works have gathered much critical attention, consolidating the significance his work today. In the words of Kreuger, the show’s curator, these pieces deal “with architecture as a metaphor and architecture as an expression of the power of the state,” revealing Durham’s aversion to notions of monumentality. Both ‘of the moment’ and outside of all current trends, Durham is a figure who continues to capture people’s hearts and imaginations. His work appeals to younger viewers and writers who admire his inexhaustible desire to challenge the world through making. In full awareness of the inequalities of power, Durham manages to transmit a sense of possibility and humour in art that does not take itself too seriously. Perfectly surmised by Anne Ellegood in Artforum in January 2009: “He asks us to consider the history of oppression, the futility of violence, and the powerlessness of our positions in the world, but allows us to contemplate these dour realities while keeping smiles on our faces. And because of this, his work is inherently hopeful”. Given Durham’s resistance to categories and classification, it’s difficult to align his work with certain moments in art history. While impressed by the work of many artists – Jean-Michel Basquiat, Joseph Beuys and Marcel Duchamp, for example – a recognition of his personality and energy is perhaps more important than comparing him to others. An individual in the truest sense, the playfulness that pervades his work seems as important as its more serious, intellectual objectives. In this sense, it’s interesting to compare Durham to contemporary artists who use humour to explore subjects like power, inequality and social convention. Think of Grayson Perry, and his perspicacious insights into the banalities of contemporary culture, as seen in The Tomb of the Unknown Craftsman (2011), recently displayed at the British Museum. 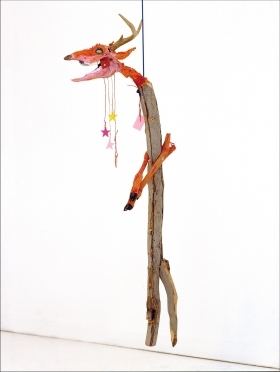 Perry’s multi-faceted practice – incorporating sculpture, tapestry, drawing and critical writing – uses humour as a tool to educate and liberate his audience. Alternatively, we could think of someone like Spartacus Chetwynd, an artist whose carnivalesque performances and sculptural installations are based on significant moments in cultural history. Nominated for the Turner Prize this year, Chetwynd’s wonderful sense of humour ensures that the profundity of her work is accessible to people from all walks of life. While in formal terms their works are very different to Durham’s, there’s something unquestionably truthful about the way Perry and Chetwynd see and interact with the world. Profoundly critical, yet somehow inherently positive, their work has an unrestrained quality that breeds feelings of hope, pleasure and possibility. Similarly, as Laura Mulvey suggests in Jimmie Durham (Phaidon, 1993): “Durham’s sculptures manifest an almost hedonistic pleasure in their materials and a confidence in their potential to evoke meaning”. As a former political activist, it’s unsurprising that Durham sees art as a liberating and inherently positive practice. As reflected in A Matter of Life and Death and Singing, the artist’s uncompromising commitment to what he calls “humanity’s thinking process” is full of radical intention. Using humble materials, good humour and wit, Durham’s work challenges the veracity of everything around us. Nothing, he seems to say, is a given, and nothing is set in stone.